The Zitelman sisters — (from left to right) Amy, Jackie, and Shelby — launched Soom in 2015. They now sell their creamy sesame spreads to chefs at restaurants across the nation. "Sesame tahini: not just for hummus anymore." So say the single-serving packets of the creamy, sesame-seed paste, the newest product from Philadelphia-based Soom Foods. From coffee milkshakes at Goldie to shrimp Dan Dan noodles at Cheu and chai-spiced smoothies at Sip-n-Glo — all of which utilize tahini — the sentiment appears to be becoming true as more and more Philadelphia eateries embrace the ingredient. And it's largely thanks to Soom. 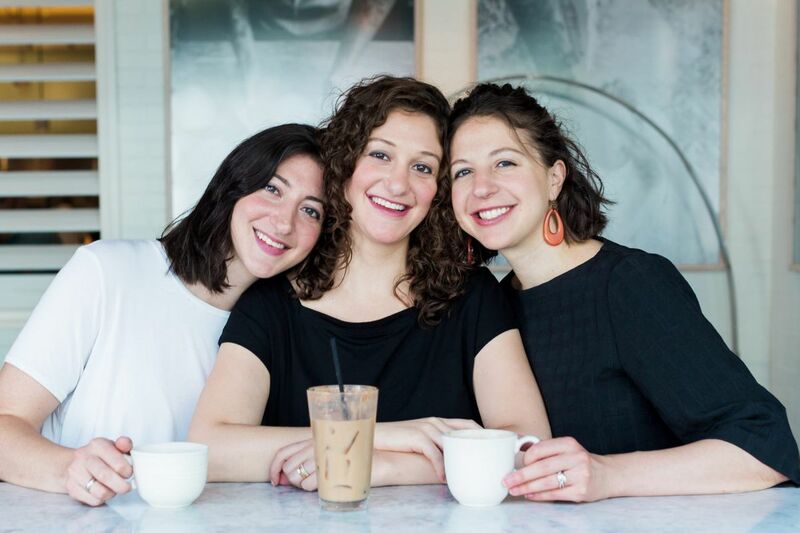 Soom is the creation of the three Zitelman sisters, two in Philly (Amy and Shelby) and one in Israel (Jackie), who set out on a mission to turn tahini into a pantry staple. Since the company's start in 2013, Soom has enjoyed widespread success, doubling its revenue each year and continuously growing its chef-driven client list. Today, Soom tahini can be found at nearly 20 different restaurants within the city, as well as dozens of others across the country. "But we still have a long, long way to go," said Shelby Zitelman, the oldest of the sisters and Soom's CEO. "We were vending recently at a food gift show in D.C., and only about 50 percent of people even knew what tahini was — and that was among a foodie crowd." But on the consumer-side of the spectrum, tahini has yet to make the strides that its most popular partner, hummus, has here in the United States. Hummus, the "official dip of the NFL," has gone far beyond a 1970s snack for vegans. Yet its second-largest ingredient — or largest, if we're talking about the version Dizengoff serves — still is widely unfamiliar to many here. Soom is sold in both original and chocolate-infused versions. So what's keeping tahini from going vogue? It may come down to a factor of quality. While Soom prides itself in creating a tahini that's as creamy and easy to stir as a natural peanut butter, many products on the shelves in the U.S. are both chalky and bitter. "The oil spills everywhere when you try to blend it together, and then it tastes bad on top of the mess," said Amy Zitelman, the youngest of the Soom sisters, who with sister Jackie recently was named one of Forbes' 30 Under 30. "I know I never used it." In fact, before Soom, none of the sisters held a particular affinity for the ingredient. It wasn't until Jackie met now-husband Omri Horvitz, an importer of sesame seeds in Israel, that the Zitelmans discovered its potential — and also their love for it. Horvitz introduced the sisters to the Israeli version of the nutty paste, derived from a white humera Ethiopian sesame seed. That seed, Soom says, makes all the difference. As with the grapes that create wine and the beans that brew coffee, the origin of the seed creates prominent differences among tahinis. "It tasted like peanut butter to me, and I was really confused, because it was not what I knew tahini to be," Shelby said of the tahini she tasted in Israel. "It sparked a lot of questions, like, 'Why do I enjoy eating this with a spoon?' "
Soon after, the sisters began importing tahini from Israel to Philadelphia and Soom was born. The product is now sold at more than 150 independent retailers across a dozen states and on Amazon in both the U.S. and parts of Canada. The new Soom Foods Squeeze Packs, which offer two portable tablespoons of tahini, are available in 12- and 24-packs at soomfoods.com and on Amazon. The Soom Foods Squeeze Packs, released in March. "Soom is revolutionizing the tehina business in America," said chef and restaurateur Michael Solomonov, who is perhaps Soom's biggest fan. Solomonov uses Soom at his restaurants Zahav, Dizengoff, Rooster Soup Co., Goldie, and Federal Donuts. "The norm in the U.S. had been tahini that was bitter and brown, a product no one wanted to use. And then there was Soom — a family- and women-owned business whose seeds are buttery and rich and complex." As the Soom sisters struggle to introduce the ingredient as a whole — and under a brand-new light as being this buttery deliciousness — they want to show consumers its usefulness goes far beyond hummus. The ticket to doing so might be through those most familiar with the ingredient — chefs. Soom sales currently are heavily skewed toward the food-service industry (80 percent), with consumers making up only 20 percent. "We think it will balance out a bit, but they service one another," Shelby said. "When more chefs include tahini on the menu, then more consumers want to find it and use it in their own dishes at home." The sisters all have their favorite, effort-free ways to utilize the ingredient. "I make these mashed sweet potatoes where I use tahini instead of cream or butter and add coconut milk and maple syrup," Shelby said. Amy loves to add a spoonful to Greek yogurt, topped with honey, granola, and bananas; Jackie enjoys drizzling it on charcoal-grilled eggplant. Across the city, chefs are playing their part in introducing the ingredient in creative ways. One of the most visible utilizations is the Tehina Shake at Goldie, which spans flavors from Turkish coffee to mint to coconut to banana. "It's hard to think about our shops without Soom," said Caitlin McMillan, executive chef of Goldie. "With the shakes, it's like liquid halvah. The tahini has this nutty, comforting quality to it — like the way dipping cookies in milk says comfort." It's the sweet angle that the Soom sisters see as the prime way to introduce new-time tasters. In addition to traditional tahini, Soom also sells a chocolate-infused version, which has seen increasing sales over the past few months. "You can simply spread it on toast, and it's delicious," Shelby said. "So then it becomes this access point for trying tahini in a way that's as easy as peanut butter." Soom plans to continue to explore the sweet market, and is testing some other sweet tahini spreads. Among Philadelphia chefs, however, the trend is toward the savory, showcasing the ingredient's versatility within not only Mediterranean cuisine but also dishes inspired from around the world. "We use loads and loads of Soom," said Ben Puchowitz, chef and co-owner of Cheu Noodle Bar and Bing Bing Dim Sum, adding that the two Cheu locations alone go through about 10 gallons a month. "There are tons of Asian recipes that involve 'neri goma' or sesame paste, which is basically tahini." It's used to add body and creaminess to the broth of the miso ramen at both Cheus, blended into a Chinese mustard sauce for beef dumplings, and also incorporated into a "pork gravy" served over noodles at Bing Bing Dim Sum, and used in the Dan Dan Noodles sauce at Cheu's Midtown Village location. Soom also makes appearances in menu specials, like steamed eggplant at Bing Bing and in other dumpling dipping sauces. Other Philadelphia restaurants using the product include Hungry Pigeon, Martha, Honeygrow, PS & Co., Animo, Sweetgreen, Cafe Ole, and Stock. "People often ask if there's cream in our Burmese style noodles because the sauce is so smooth," says Tyler Akin, chef and owner at Stock. "It's markedly better than the other stuff I've encountered — more pure, nuttier, and a better texture." While creamier than other counterparts on the market, Soom comes at a premium price. Imported from Israel — within reach of Ethiopia, where the prized sesame seeds are cultivated — the tahini travels nearly 6,000 miles before reaching Philadelphia. It's a far longer route than that of the seeds traveling from Central America, a popular origin for many tahinis created in the States. Coupled with the fact that Soom is still in the start-up stages, the price for the product ranks on the high side among its competitors. It's a trade-off that many chefs are willing to endure. "It definitely costs more money than what we were looking to spend, but it's a superior product," said Justin Rosenberg, founder and CEO of Honeygrow. "And we like supporting small businesses." As Soom continues to promote the ingredient, the sisters know they're going to need all of the support that they can get. "We like to compare it to when people took kale off of the display of buffets and onto plates," Amy said. "It takes education to turn an unknown ingredient into a popular one, but it's possible." With the new single-serving packets launched this past March, Soom hopes to enable more people to sample the product. The sisters have learned that putting the ingredient into action speaks louder than words when it comes to selling it — even among their own family. "Our aunt was cooking with friends at their local synagogue, making a ratatouille and the ratatouille was too watery," Amy said. "The kitchen leader said, 'Let's add Soom to make it thicker! ', and our aunt was mortified. She didn't want to do it, but it turned out delicious, and she called us and said, 'I think I understand tahini better now!'"